A really fun way to serve bread over the festive period. 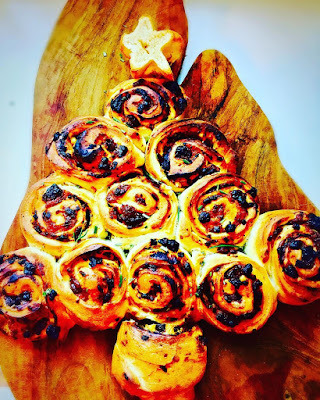 A pull a part loaf with a festive difference. Bake the star separately as it only takes about 12 minutes. This can be made in a square tin if you prefer or after the festivities. 2 stems of rosemary destalked & finely chopped. Turn out onto a floured work-surface and knead for 30 seconds to knock back the dough. Roll into a large, neat rectangle, 1cm thick and brush liberally with the cranberry sauce. Tear the cheese into bite sized pieces and scatter all over the cranberry sauce along with the dried cranberries. With the long side of the rectangle nearest to you, roll the dough away from you into a tight spiral. Brush with a little melted butter to seal the roll. Trim off the ends and slice the roll into 12 equal portions. Place one off cut into a greased star shaped cookie cutter, now place one bun at the top of the baking sheet, under this place two buns, next three, final add 5, use the remaining one to create a stump. Cover with oiled cling and prove for about 30 minutes. Bake the star offcut for about 10-12 minutes. Cool for 10 minutes on the tray, before removing to a wire rack. Scatter with a few extra dried cranberries and chopped rosemary to serve.